Lois proceeds through checkpoint after checkpoint.�After being cleared through every level of security she is led down to a sealed lab.�As the door slides open, Lois is shocked to see a man hovering in a sphere, and completely colorless.�Lois approaches one of the doctors and questions him about the condition.�The doctor declines to answer, but does tell Lois, off the record, about the man.�His name is Major Victory, and he the first and only documented case of what they are calling 'anti-chromatic syndrome'.�His brain is registering like a coma, but from his screaming inside the sphere it is clear that his true condition is anything but comatose. Lois returns home to find the apartment dark.�Opening the note taped to the TV, she learns that Clark is off preventing a meteor storm.�He apologizes for not being there and says he will call as soon as he can.�With a sad look, Lois heads to bed. The next morning in the Daily Planet Lois speeds along at her computer when suddenly a tour group passes through the newsroom.�She notices that nearly every one of them is sporting Superman gear.�She stops a straggler and asks him where everyone bought the Superman apparel and he tells her about a new store that just opened up across town. Heading downtown, Lois finds herself standing outside of a concrete building; Superman symbols emblazoned on the walls.�Proceeding inside she dodges around children and adults alike, and moves to the office in the back.�Inside she finds Funky Flashman.�He tells her that Superman is bigger than every other icon combined, and he is making peoples' dreams come true.�She asks about legal right but he tells her that they just laughed when he tried to copyright the logo.�He also tells Lois that he's got a factory of third world workers cranking the stuff out.�With a smile on his face, Flashman excuses himself. Walking out of the building, Lois calls her husband and explains the situation to him.�Clark asks if he should take care of it, but Lois says that she'll do it, it will give her something to do at night.�Clark then apologizes for being away so much, and offers to make it up to her with a date that evening.�He tells her to rent a penthouse suite at the plaza and meet him there at 10.�He says that he'll just swing by the apartment to change clothes and then he'll be there.�With a smile on her face, Lois tells him to wear the uniform. That night Lois, clad in an evening gown, prepares for Clark's arrival.�She suddenly turns around to find Superman hovering in the darkness.�The two play out their roles, Lois asking the interview questions and Superman answering them.�Then, picking Lois up, the couple soars into the moonlight.�Flying high into the sky Superman pulls her close and, wrapped in his cape, the two kiss passionately. Flashman stands in front of an assembled group of reporters announcing his new superhero line, encompassing everyone from Wonder Woman to Green Lantern.�Amidst the crazed consumers Lois catches up with Flashman.�She again questions whether what he is doing is right, but Funky just ignores her.�Then, Lois tells him that as long he is selling everything else, he should be selling supervillain merchandise as well.�Funky pauses for a second and then celebrates 'his' genius for thinking of it. 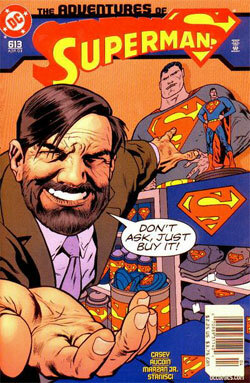 That night Lois watches Flashman's new commercial as he displays his new supervillain line.�That night, Flashman retires to his office and makes a phone call to discuss franchising his business.�Suddenly the temperature in the room begins to drop and abruptly Flashman's hand is hit with a ray, trapping it in ice. Captain Cold stalks towards the entrepreneur with a grim expression on his face.�Cold tells him that he represents the villains, and they aren't going to stand for their likeness being abused for his profit.�Leveling his freeze gun at Flashman's head, Cold tells him that he is going out of business.�Flashman's screams, until his screams are suddenly cut off. Valentine's Day.�Lois returns home to find a note from Clark taped to the television.�He says that he took care of the manufacturing plants and that he has no intention of missing their Valentine's Day tradition.�That night the couple lies together, sleeping soundly without a care in the world. Story - 2: So it seems to me like there are two stories here.�On one side, there is the story of Lois's and Clark's marriage and the strain placed on it.�I thought this was very well done.�The notes taped to the TV and his calls from the Watchtower were touches that are seldom used to show how much time they really spend apart.�Clark doesn't have to sleep all that much, so it's very logical that Lois would have a lot of lonely nights.�The scene taken from the movie (the balcony dinner in case you didn't catch that) brought a smile to my face.�And the flying into the moonlight was cliche but still a very nice touch.�If you ignore the fact that Lois and Clark are getting a penthouse at a very nice hotel in the DC equivalent of the expensive side of New York on Lois' salary (this did kind of bother me, Clark doesn't have a job and they do have bills to pay) then the whole scene was great. However, then there is this side story with Funky Flashman that is filled with holes.�First of all, there have been superheroes on DC Earth for about 12 years now, DC time.�That's not even including the Mystery Men and the JSA of the 40s.�Are we honestly supposed to believe that no one thought of doing this before?�Then there is the fact that we have seen it done before.�Superman/Toyman had an action figure line, and I'm almost positive that the supervillain twist has been used before too.�Then there is the fact that someone does own the trademark on the Superman name and logo.�Rex Leech trademarked it 10 years ago in Adventures of Superman #502 or so.�If I'm not mistaken, then Roxy sold it back to Superman for a dollar.�So that blows that whole idea out of the water.�Then there is Flashman admitting to Lois that he is using sweatshops and then saying he'll deny it.�Isn't it Lois' job to uncover the truth when people lie?�Then there is the whole demise of Flashman.�Lois knows what will happen when she clues him in to the supervillain idea, and because of it she indirectly caused the death of a marginally innocent man.�Knowing that they would come after him, Lois pretty much tells Flashman to start making villain products.�Not exactly the kind of thing that Superman and his wife should be involved in. So in summary, the relation ship bit was great, and I enjoyed it thoroughly.�I'm not quite sure why Major Victory showed up, but we'll let it slide.�And then the Flashman portion was inconsistent, didn't fit with continuity, and was out of character for Lois and Clark.�Average them out and you get a two at best. Art - 3: The art in this issue, like much of the art now, was only average.�I really liked the splash of Lois and Superman in the moonlight.�It was unnecessary, but it fit.�However, one page earlier you have a shot of Superman carrying Lois and his face looks horrible.�The rest of the issue was just so-so.�Nothing really stuck out in my mind, but nothing was really bad either.�I just hope that we can get some better art on the books in the future, and preferably the near future. Cover Art - 3: The cover suffers from the same problem as the interior.�It just really doesn't do anything for me.�It's a good representation of what's inside and it has some form of backdrop, but it still isn't that great.�Other that the blatant word balloon desperately telling everyone to buy this book, there is nothing to make this cover stand out at all.�The color scheme is also pretty bland.�The colors (like on most of Nowlan's covers) are all washed out.�There is nothing on the cover that makes you want to buy the issue, although I suppose that's pretty fair because other than about 5 or 6 pages of it there weren't many reasons to read this issue anyway.